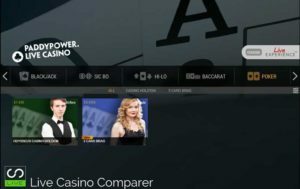 Playtech Live 3 Card Brag - A detailed review of the game and how to play. The object of live 3 Card Brag is to beat the dealer with a better 3 card poker hand. The dealer has to qualify with a Queen or higher to be able to play against the player. If it’s less then the players Ante Bet gets paid even money and the play bet is returned. There’s the option to play a side bet of Pair Plus. 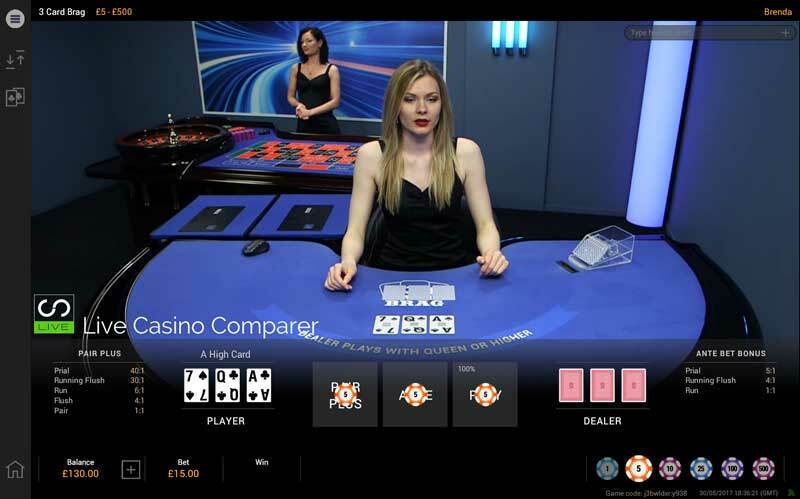 The side bet pays enhanced odds for a pair or higher even if the dealer has a better hand than you. Playtech Live 3 Card Brag is very similar to Evolution Gamings Live 3 Card Poker. The only notable difference between the two is the value of the top hand. In 3 Card Poker, it’s a Royal Flush. In Playtech Live 3 Card Brag it’s 3 of a kind, which is called a PRIAL. Although there is no distinction between them in this version of the game, the best Prial you can get is three threes 3-3-3, followed by three Aces, 3 Kings etc. 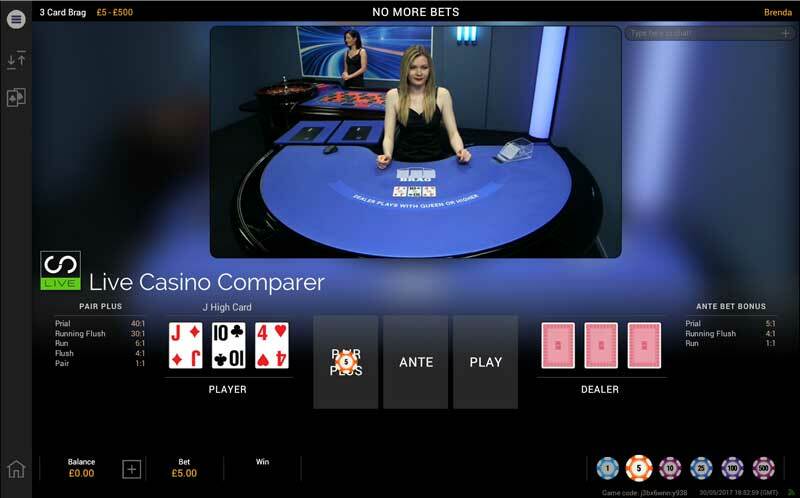 The game can be found in the Playtech Live casino lobby under Poker. It’s played with one deck of 52 Playing Cards. The deck is shuffled before each new hand commences. A shuffling machine and two alternating packs of cards are used to keep the pace of game play high. Before any cards are dealt the player must place at least one initial bet to play. This is normally the Ante Bet, but in 3 Card Brag you can just play the Pair Plus side bet without placing an Ante Bet. The more traditional way to play is to place an Ante Bet and optionally the Pair Plus bet as well. The betting round counts down from 15 seconds so there’s not a lot of time to place your bets. Usefully, there is a Repeat Bet and double you bet option that’s displayed if you’ve played at least one hand. If you’ve not got Auto Confirm bets already set in your settings you’ll need to confirm the bet manually before the timer runs out. After all the bets have been placed the dealer will deal 3 cards face up to the player position. He’ll also deal 3 cards face down to the Dealers position. The player then has two options. To Play or Fold the hand. Play – If he wants to play the hand he either hits the Play button, which will place an additional bet equal to the ante. If the player has just played the Pairs Plus side bet, no further actions are needed, as the bet is in play as soon as it’s made. Fold – If the player believes that the hand won’t beat the dealer then he can Fold his hand and the Ante bet is forfeited. The Dealer then turns up his cards face up. The Dealer needs to qualify with a Queen or better as a high card to continue the game. When the Dealer’s hand doesn’t qualify with a Queen or better, the Ante bet gets an even money payout and the Play is a Push (your play bet is returned to you). 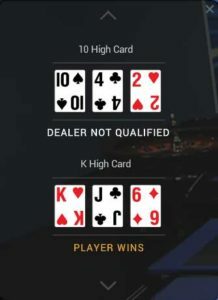 In instances when the Dealer’s hand qualifies, the Dealer and the Player hands are compared. If the player has higher cards, then both the Ante and Play bets get at least an even money payout, (See payout table). If the Dealer has a better hand, then both the Ante and Play bets are lost. The Pair Plus Side Bet gets paid out if the player hand contains a pair or more. It pays out even of the dealer has a better 3 card brag hand than the player. That’s why you see some people only playing the side bet. Hands are ranked as Poker hands. The lowest hand value is a High Card and the highest hand value is 3 of a kind or Prial. The Highest Prial is 3-3-3, followed by A-A-A, K-K-K, Q-Q-Q and etc. Known as 3 of a Kind in 3 Card Poker. A sequence of consecutive cards of the same suit. A sequence of consecutive cards of different suits. Known as a Straight in 3 card poker. Three cards of the same suit. If you and the Dealer have the same Flush, the High Card rule applies. Two cards of a matching rank, A-A being the highest, followed by K-K, Q-Q and etc. The highest card in your hand. Ace wins, followed by K, Q and etc. If the Dealer has an identical set of cards, regardless of the suit, your bet results in a Push. The Ante Bonus is paid when you have one of the hands listed below, regardless if you beat the hand of the Dealer or not. If you choose to Fold you are not rewarded with the Ante Bonus, even if your hand qualified. Regardless of the hand of the Dealer, you win the Pair Plus bet if you placed a bet on the Pair Plus position and your hand contains a Pair or better. If you choose to Fold you lose the Pair Plus bet, even if your hand qualified. There’s lots of information available in the playing interface. General Settings – Disable pop-up messages. Game Settings – Auto confirm bets & Tool Tips. 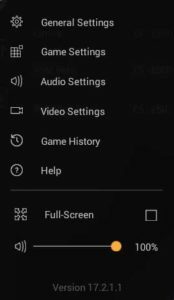 Audio Settings – Volume, Game sounds and Dealers Voice. Video Settings – Select the quality of the stream. Game History – Displays your betting history in the game. Help – Contains the rules of the game. This shows the last few hands that the dealer and player had. If you’re looking for your hand history, that can be found in the settings menu. You can view the game in two modes. One is the classic full screen. The other is the mixed mode which you normally see when your connection speed is not very good. Based on playing the optimal strategy, the theoretical return to the player percentage (RTP) is 98.00% for the Ante bet and 97.86% for the Pair Plus bet. A useful feature is you can make deposits and withdrawals whilst still in the game. Another window opens when you select the + symbol by the Balance.